While the Bravery are certainly not in league with the Strokes, Interpol, or the Yeah Yeah Yeahs, this record is a strong one with some unexpected surprises. Island Records is hoping that the Bravery are the new Strokes, or at least that you'll believe that they are new Strokes enough to buy their debut album, The Bravery. Island beat out several other record companies who were itching to sign the latest alternative-rock darlings from New York City. In the last few years the Big Apple has given us the Yeah Yeah Yeahs, Interpol, Ambulance Ltd, and, of course, the Strokes. And as you no doubt know, the record companies are going to continue to play the next-hot-New-York-band card until it's no longer profitable. Given the hype surrounding this record (the Bravery have been written up in both Spin and Rolling Stone as one of the bands to watch this year), I was prepared to be disappointed. Their debut, however, has surprised me. While the Bravery are certainly not in league with the Strokes, Interpol, or the Yeah Yeah Yeahs, this record is a strong one with some unexpected surprises. To compare the Bravery to the Strokes is a bit unfair, since their only real similarity is that they are both over-hyped New York City bands. While the Strokes' sound was culled from 1970s garage and punk rock, the Bravery, like the Killers, sound a bit like Duran Duran or Depeche Mode shot through with a dose of alternative attitude. Their lead single, "Unconditional", released last year on an EP, gives you a good idea of how they are different from their New York neighbors. The drums are steady and cascading, while high, repeating synth line accompanies singer Sam Indicott's low, loungey sounding plea, "I just want / something for nothin'." They are more polished, driving, and put-together than bands like the Strokes or the Yeah Yeah Yeahs. The Bravery often swing between raucous dance music, akin to Franz Ferdinand, and soaring, synth- and guitar-driven choruses, akin to the Killers. To view them solely through the lens of the New York scene is to unnecessarily limit your options. One unexpected influence that comes screaming through a few tunes of this album is Brian Eno. One of the album's strongest tracks, "Fearless", features a bright and brassy synthesizer hook that sounds right out of Roxy Music, while Endicott gives up on his low croon to engage in a bit high-pitched, loose-lipped squealing that would be very much at home on Here Come the Warm Jets. "Public Service Announcement", another standout, features a funky drum beat, a bright and looping bass line, a simple and beautiful guitar line, and, to top it off, a kooky chorus of "woo hoos" bubbling up behind the entire track, all very tight and together, a la Fear of Music. What I love about this song in particular is its sense of fun and abandon. 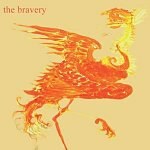 Much of the Bravery's materials can be a bit heavy and dark, but this song's chorus of "Stop, drop, and roll, / you're on fire!" is silly and endearing, letting you know that these guys can party in addition to just complaining. In general, however, the Bravery are intense, a bit dark, but always driving and rocking, propelled by well-chosen synth lines, steady and kicking drum lines, active yet tasteful bass work, and loud, crashing guitars. Their songs tend to coast on a high plane of intensity and emotion, starting with a head of steam and keeping up that momentum for three or four minutes. These are songs to bang your head or tap your foot to, not to sit down and dissect. What will hold the Bravery back from superstardom, though, is an indescribable lack of spark. Endicott's vocals are more than adequate, but he lacks an attitude, a recognizable persona that jumps out at you and says, "We are the Bravery!" His vocals tend to sink into the texture of the track, becoming one with the music. While that's all fine and good, it leaves me a bit confused about what I'm supposed to be getting out of the Bravery. When you listen to the Bravery's competition (the Strokes, etc. ), you get a very particular feeling and mood, most often communicated by the style and personality of the lead vocalist. Over the course of this very brief debut album, Sam Endicott never leaves his mark; he's not defined by sexiness, or aggression, or humor, or inspiration. He just kind of fits with the music, but you need more than that to truly be the next big thing in the alternative music landscape. This debut is certainly promising, and I look forward to seeing whether the Bravery can begin to carve out a more concrete and distinctive image and place for themselves.